When he was a 12-year-old city boy, Markley Gordon Wolmans mother sent him to stay for the summer at a Connecticut farm, several miles inland on the banks of the Mystic River. My mother said she wanted me to know that milk didnt come from a bottle, Wolman says. Her scheme worked perhaps too well: Wolman (known as Reds, along with many other native Baltimore redheads) became a complete cow nut, as he puts it. And after two summers on the farm, Wolman also developed a lifelong obsession with erosion and anthropogenic impacts on the landscape. In January, geomorphologist Reds Wolman received the Lifetime Achievement Award from the National Council for Science and the Environment. Photo by Naomi Lubick. Now, Wolman is recognized as an eminent geomorphologist of his time. He most recently accepted the Lifetime Achievement Award from the National Council for Science and the Environment, at the organizations annual meeting last January in Washington, D.C. (see comment, this issue). 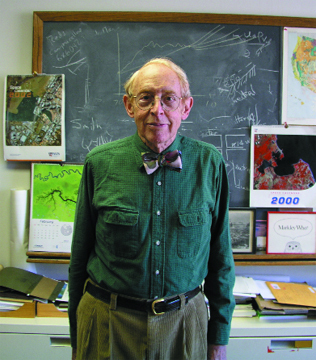 He is also a recipient of the Geological Society of America (GSA) Penrose Medal and the American Geophysical Union Horton Medal, among a multitude of other honors. He has served as GSA president and is one of the few geomorphologists in the National Academy of Sciences. Over his career, Wolman has sent a slew of geomorphologists with his scientific style across the country and the world. Reds Wolman is the son of a well-known Wolman: Abel, one of the first so-called sanitary engineers. Abel Wolman set up city water infrastructures from Calcutta, India, to Portland, Ore. He and a co-worker first determined the method for controlled chlorination of water. With filtration and chlorination, urban typhoid rates dropped precipitously, as much as 90 percent in 15 years in some places. You dont need any marvels to make a difference, Wolman says, as his father showed in his sanitation work. The elder Wolman included his son in luncheon gatherings at their home, a third-floor walkup in Baltimore. Wolman would listen to his fathers colleagues discuss political issues and science, a remarkable education, he says. While at Harvard, Wolman overlapped for a year with Luna Leopold, son of another geoscience family. Leopold had tried to persuade Wolmans older colleague John Miller to join him at USGS. Miller instead took a job teaching in Pennsylvania, and Reds went to the USGS office in Washington, D.C., in his stead. Im a child of really good fortune, Wolman says. He and Leopold would fly out to Nebraska, pick up their gear and head out to Wyoming, Colorado and elsewhere in the West, spending their four- to five-week-long summer field seasons fishing, camping, checking gage stations and surveying. We were traveling in some of the most wonderful country in the world, Wolman says, often joined by other geologists. During his time at USGS, Wolman completed his Ph.D. dissertation (published in 1953) on a stream in Pennsylvania; since then, Brandywine Creek has remained a well-known case study in geomorphology. A year later, he published what is now known as the Wolman pebble count method for grain-size distribution in riverbeds. After his tenure at USGS, Wolman returned to Johns Hopkins as a professor in 1958 (both he and his father were undergraduate students and professors there), to head the universitys geography department, which was later expanded to geography and environmental engineering. In 1964, Leopold, Wolman and Miller published Fluvial Processes in Geomorphology, a seminal textbook that was republished in 1995 and is still in use. About 1.5 to 2 billion people in the world dont have adequate drinking water or sanitation; thats an immense [mortality] burden, Wolman says, issues initially linked by his father. Every place in the world, you are likely to put human need before ecological need, but you have to be careful about that, he says, because people ultimately are dependent on the quality of their water sources. Reds Wolman continues to teach geomorphology  and how to think  at Johns Hopkins. And almost every year, Wolman says, he goes to the state fair to see the cows.